The myth of the transparent organisation. We will hear that transparency is good for organisations and organisations will even tout their transparency. In many cases, the organisations believe what they are doing is transparent. They publish information on a regular basis that describes decisions, financial positions, and future strategies. In this, transparency is a means to an end for the corporation as it appears to be a good corporate citizen. Here we see the beginning of the problem. The organisation wants to appear to be transparent. The appearance becomes the goal rather than the reality. This has two consequences one external and the other is internal. We can see the external consequences very simply. In the external realm, the organisation sees transparency as an issue that affects its reputation. Transparency must be managed like its reputation. The goal is not to be transparent but to appear transparent. The transparency will be managed. The organisation will publish what best suits its interests and its reputation. Such an approach is not surprising. Human nature is such that we want others to see us as we see ourselves. We want to control how others view us. Transparency means that someone else can potentially see the organisation as it is rather than as it appears to be. Transparency in this sense can become a form of accountability. It is hard to be accountable. For an organisation that focuses on its reputation, any transparency, except that filtered and managed for appearance and reputation, will threaten it. The transparency will make the organisation accountable in a way that it cannot control and will be resisted. The organisation sees transparency as a barrier to what it wants to do. One way to avoid the barrier is to claim it is already accountable. The problem though is that accountability can mean two things. The public will want vertical accountability and the organisation will want horizontal accountability. 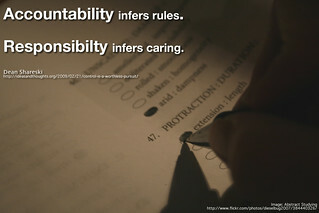 The term vertical accountability refers to the audience that holds the organisation to account. The audience is either the employees or to the public. By contrast, horizontal accountability has a different audience. The audience is peers such as the board or the regulators. The organisation does not exist and hold power, either corporate or political, to be held to account in ways that they cannot manage. Externally the organisation wants to be seen for what it appears to be rather than what it is. This brings us to the internal consequences. Transparency is difficult when you are opaque to yourself. To manage its reputation, an organisation will become opaque to itself. The organisation will control what is said by staff to align with its reputation. The control is usually informal or cultural. Take for instance the public sector. Some public sector organisations publish their corporate management team minutes and transparency information. For some organisations they will publish more than the minimum because that is their culture. For others, they will publish the minimum and present it to suit their interests. If something is a sensitive topic, such as spending on consultants, the term consultants will be replaced with something less noticeable like professional services. The organisation considers itself transparent and accountable. Such a scenario may seem farfetched. Perhaps it is. Yet, it reflects a dysfunctional culture. The culture resists transparency. It may want to be praised for being open and transparent, but it resists accountability. Where this occurs, we often see a perception gap between senior managers, middle managers, and junior employees that creates perverse outcomes. The perception gap creates perverse incentives. The perception gap that creates perverse outcomes occurs in the following way. Senior manages agree a plan to deliver a widget in 10 days. They want to beat the target of 20 days. They tell the middle managers this without consulting them. They are consulted by being told the plan. The senior managers expect them to do as they are told. If the widget will be delivered in 10 days, then it must be delivered in 10 days. It is for the middle manager to work out the details. The middle manager, in turn, then has to deliver the 10 days target against their other work. To meet the target, frontline team do perverse things. They send a lower quality good or they massage the figures. They will count delivery as the day shipped. The senior managers are pleased because they see the 10 day target being met. The frontline staffs become disillusioned because they see the senior managers are out of touch. The middle managers lose respect because they cannot convince the senior managers the target is wrong and they allow perverse outcomes so that they can show they can meet the targets. The internal problem comes when the gap between appearance and reality becomes too great to manage. The desire to manage the external reputation, rather than let it reflect the reality, infects the internal culture. The same perception-perversion gap will occur. The issue is not the gap between appearance and reality but the size of that gap. As the gap increases the internal culture becomes dysfunctional. In an extreme form, we can see this in the failure of Enron where the image of the executive was maintained until it could not be maintained anymore and the market was able to see the company for the shell that it was. We may consider these aberrations, yet, the underlying issue is that companies resist transparency that will show this gap and they are trained to resist it. In particular the training to resist the transparency can be seen in things like single loop learning or blame avoidance. When a problem arises, the managers will act quickly to solve the problem. If the problem persists, and threatens the appearance, “we are a good company at x”, then the manager faces a choice. They have to explain a problem that threatens to undermine the reputation, the appearance, which the organisation is defending. Most employees want to be good employees and do what is good for the company. As a result, they may report the problem in such a way as to avoid blame without explaining that the reputation is wrong. In this regard, they do what is best for the company, or rather the senior managers, protect or support the reputation, rather than explaining the reality. If a junior officer tries to do the right thing and describe the reality, their senior managers may be embarrassed or seek to avoid blame by claiming that the junior officer “does not have all the details or the wider perspective on the issue”. When this occurs, the junior employee sees that it is better to deliver only so much transparency that will be accepted by the senior managers. The culture changes so that the employees embrace transparency that affects them or harms them. If it affects the organisation, the goal is to “contain” the crisis and limit transparency. The organisation’s reputation becomes the overriding goal for employee. For organisations, as for governments, silence protects them. They will resist anything that breaks that silence especially if they cannot manage it. The organisations and its executives want transparency that they can manage. They want to decide how they are seen. The goal is to keep others from knowing the organisation as it is rather than as it appears. The transparent organisation while well intentioned becomes a practice in reputation management rather than a change in culture or behaviour. What is to be done to avoid the problem? First, the organisation needs to work at being transparent to itself. This means it must have good internal communication so that bad news or news that contradicts the public reputation can be reported upwards. Second, the organisation must align its reputation with its reality. If it is constantly seeking awards, the issue is whether it is in the business of winning awards or delivering a superior product. The first is about reputation management the second is about excellence. Third, the organisations need to focus on the outcomes that are best for the company not just for senior managers. This is often the hardest part as senior managers rarely like to become powerful to be held to account. This entry was posted in compliance, coruption, learning organisation, transparency and tagged Accountability, Business, Enron, management, Organization, transparency, United States. Bookmark the permalink. 1 Response to The myth of the transparent organisation.